I think The Cars said it best with “let the good roses roll, let the good roses ro-o-oll,” or was it good times, either way both were extremely good statements. The summer is off to a mild start here in Manhattan and the slow set in of the seasons heat is much appreciated. Giving us ample time to enjoy this summers roses before we fall back in to colder weather and hardier wines. After hearing many small buzzes about Brad Pitt and Angelina Jolie’s new adventure in the world of wine last year, this year I decided to pick up a bottle. 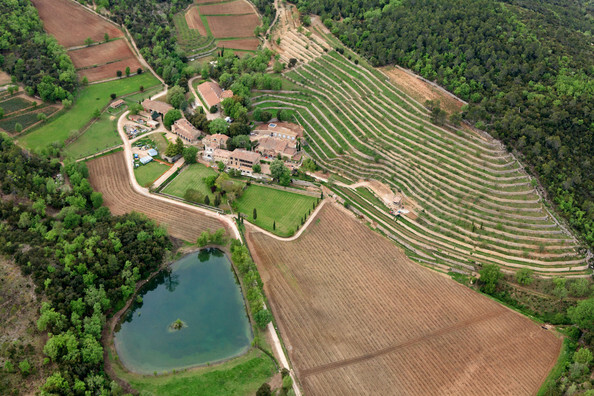 Chateau Miraval sits on the cusp of two Provencal wine appellations Cotes De Provence and Coteaux Varois. Its original owner was French jazz pianist Jacques Loussier who had many bands and artists journey to the vineyard to record and collaborate. Sting, The Cranberry’s, and most notably Pink Floyd (who recorded tracks for their album The Wall there in 1979) have all been inspired by the picturesque tranquility of the land at Chateau Miraval. Time Dove purchased the Domaine in 1993, and its most recent owners/operators are none other than Hollywood’s leading couple Brad Pitt and Angelina Jolie who purchased the Domaine in 2012 for an estimated 60 million dollars. The wine making side of the venture is overseen by the Perrin Brothers (Marc and Pierre), both known for their Rhone Valley wines. This rose is made pink from the “Saignee” process used in the pressing of the Syrah grapes, before blending occurs. Done 95% in stainless steel vats with 5% in barrels with “Batonnage”. Light +/Medium – Body 13% Alc. By Vol. I was very surprised by Chateau Miraval. It smells and almost tastes like a Sancerre and I could see myself heading down this path if I was doing a blind tasting on the wine. Limestone is present on the nose along with hints of cherry, vanilla, pear, and lemon zest. Although I tend to stray from Provence roses because I find them a bit to acidic for my taste, Miraval’s rose is incredibly balanced making a wine that is refreshingly easy to consume. The palate was laced with very light fruit flavors of strawberry as well as slate and granite notes. It has a bright acidity in the mouth trailing at the end with a light tartness that leaves you wanting more.